The stand itself rises to a maximum height of 10.5' (3.2 m). This is a Matthews Black Century "C" Plus Turtle Base Stand with 40" main riser with removable turtle base. This 40" Hollywood Black Gobo Arm features the strongest and most popular Grip Head in the industry. Guaranteed to hold, it will not slip. Plates feature two holes 3/8 and 5/8", eliminating confusion. New castings offer positive lock in all directions. Box Dimensions (LxWxH) 54.0 x 24.0 x 4.0"
Box Dimensions (LxWxH) 40.0 x 5.5 x 0.6"
Box Dimensions (LxWxH) 6.55 x 3.35 x 2.45"
Century C+ Turtle Base Grip Arm Kit, Black - 10.5' (3.2m) is rated 4.7 out of 5 by 32. Rated 3 out of 5 by kenyee from Horrible paint job Straight out the package, someone at the factory had slid the top section in while the paint was half dry so it looks really blotchy (showed Matthews the pictures but they didn't offer to replace it...I would have). The paint scrapes off pretty quickly when you screw in the knobs and attach lights to it. The black paint is also thick enough that the 5/8 arm is no longer 5/8 so you can't attach a light to the end of the arm. Matthews really needs to look at a black chroming process. Look at Avenger if it truly is made of black steel. As it is, you might as well get it in chrome and spray paint it flat black or gaffer tape it if you want to avoid lens flare...I'd recommended you get the chrome version instead. Rated 5 out of 5 by sierraimage from Best stand I own Love the Matthews c-stand. Nothing but quality build, solid and nice detail. It's more than heavy enough but not too heavy to avoid using. The paint finish is like all painted stands and time will tell how well it will hold up. I like the diameter of the pipes over the impact brand but both are excellent for the price of either. I use both and I like the Mattew's just a bit better due to the small details that don't really matter like the feel of the bolt knobs, the welds instead of the bolt through legs etc. But nothing serious. Both are great stands and you can't go wrong with either. Rated 5 out of 5 by BD from Durable and Versatile You can't go wrong with Matthews C-stands. With the turtle base these stands add another layer of versatility, allowing you to mount lights or other hardware closer to the ground. The removable turtle base also makes it easier to break them down and pack away. Rated 5 out of 5 by Erik S. from Super versatile -- wee bit shorter than standard C Stand Awesome, solid, always works. Do note that because the bottom of the C-stand vertical member is solid, it cannot contain the telescoped part of the risers as far as the standard C-stand. I'd guess that fully extended the turtle base version is about 10 shorter than the standard. I did not measure. Be aware that the legs fold slightly differently. They fold up to the same size as standard feet, they just do it in a slightly different way. I think it's because there is some kind of spring in the turtle base legs. Very worthwhile IMHO. Makes packing way easier. Rated 5 out of 5 by Dyl the Dawg from The last C-Stand you'll ever need. These are the professional stands! Look no further, unless you need mountain-legs, you're guaranteed an incredible c-stand for life buy buying these. GO GET THEM! The black-matte finish is my favorite. Looks really profesh! Rated 4 out of 5 by Michael from Excellent, Versatile Equipment for the Studio I've had all kinds of stands for the studio and these have quickly become our favorites. Heavy duty and extremely versatile, these Century Stands and Arms really serve a variety of purposes for holding lighting, reflectors and the like. The slight downgrading in the rating was because we bought two of these Matthews kits. One arrived in great shape. The other required that I lubricate all of the threads and moving parts before it could be used. So there was some variability in the manufacturing or assembly process. Everything seems to be fine now. Rated 5 out of 5 by Scott from C-stands make wonderful companions I prefer Matthews C-stands because they're built like a tank. This thing will probably outlast me. If you're still relying on bitty little tripod light stands, take the plunge and get the real thing. 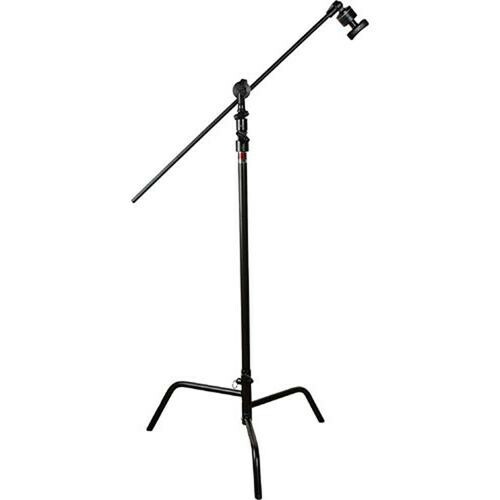 First, this C-stand extends higher than the typical cheap light stand. Second, the boom arm and grip head have a million uses. With a pair of them, you can hang a roll of seamless paper. You can extend a backlight over someone while keeping the stand out of the frame. And once domesticated, C-stands make wonderful companions. I make that joke because I love this C-stand. I have three. The legs come off for when you need efficient storage. The black color helps them stay out of sight, and they don't reflect into your frame. This is the utterly essential basic upon which to build your grip kit. The more you have, the merrier! What is the column diameter of this c-stand? I have this Matthews B756140 can I order a wider base? We only make one size at this time. No, it is not spring loaded.